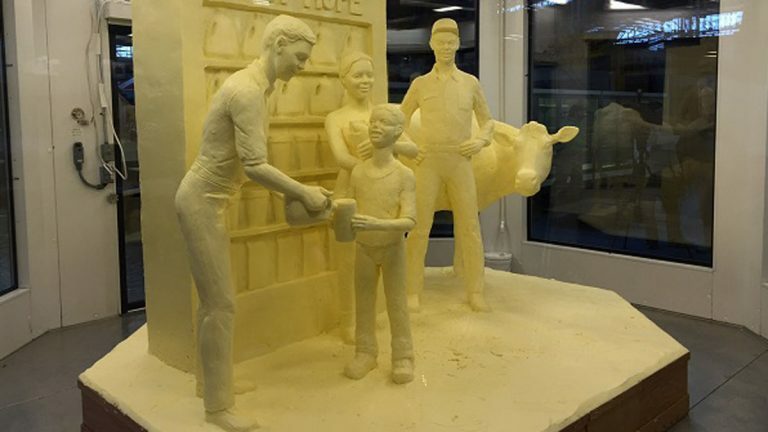 Farmhands and dairy princesses watched Thursday as the Pennsylvania Farm Show’s traditional centerpiece was unveiled: a massive butter sculpture. Blinds obscuring the piece rose, revealing a butter boy having his butter cup filled with butter milk as a butter cow looks on. The half-ton of butter was donated by Land o’ Lakes in Carlisle, Cumberland County. “I wanted to thank the dairy farmers of Pennsylvania because, without their butter, we couldn’t have done this sculpture,” said Jim Victor, who made the piece in just over 10 days with Marie Pelton, his wife. The pair has churned out similar sculptures for years now, in Pennsylvania and at agricultural fairs across the country. Most pieces are lipid-based, such as butter and chocolate. Cheese is Pelton’s favorite medium, because it comes with tasting breaks. “You eat it along the way, test it … try the material out here and there,” Pelton said. The Farm Show sculpture, made from butter waste, isn’t fit for nibbling. It’ll be sent to a farm in Juniata County, fed into a butter digester and converted into electricity. Beekeepers and apple growers occupied the exhibits on either side of the sculpture, preparing their wares for judging scheduled early Friday. Photographers and television crews crowded the butter box. Production lights threatened to melt the sculpture down to size if not for the climate-controlled chamber housing it. A farmhand walked up to one window, looked the sculpture up and down, and turned away. “I should be over with the cows,” he said. 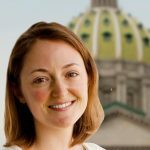 The Pennsylvania Farm Show, billed as the largest indoor agricultural exhibition in the country, continues through Saturday.